Shamsi Biranvand, Z., Mousavi, S., Shamsollahi, M., Cheraghi, J., Taherpour, K. (2014). Effects of chlorpheniramine (histamine H1 receptor antagonist) on food and water intake in broiler chickens in hunger and satiety. International Journal of Advanced Biological and Biomedical Research, 2(2), 321-327. Zahra Shamsi Biranvand; Seyyed Gholam Reza Mousavi; Mohammad Shamsollahi; Javad Cheraghi; kamran Taherpour. "Effects of chlorpheniramine (histamine H1 receptor antagonist) on food and water intake in broiler chickens in hunger and satiety". 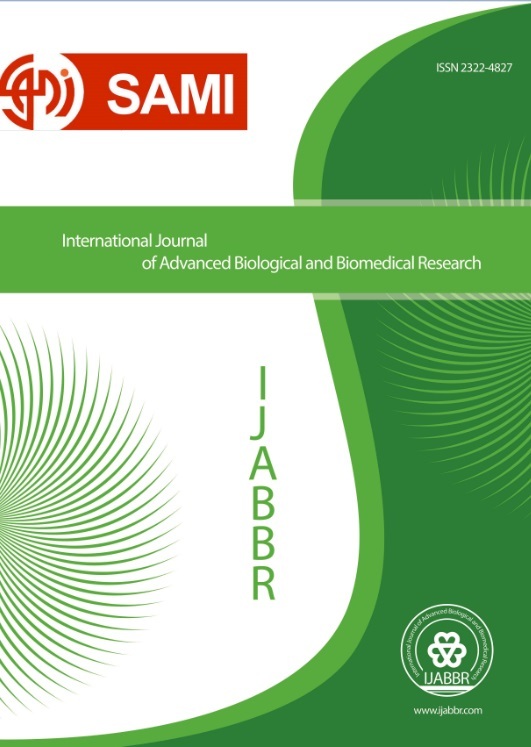 International Journal of Advanced Biological and Biomedical Research, 2, 2, 2014, 321-327. Shamsi Biranvand, Z., Mousavi, S., Shamsollahi, M., Cheraghi, J., Taherpour, K. (2014). 'Effects of chlorpheniramine (histamine H1 receptor antagonist) on food and water intake in broiler chickens in hunger and satiety', International Journal of Advanced Biological and Biomedical Research, 2(2), pp. 321-327. Shamsi Biranvand, Z., Mousavi, S., Shamsollahi, M., Cheraghi, J., Taherpour, K. Effects of chlorpheniramine (histamine H1 receptor antagonist) on food and water intake in broiler chickens in hunger and satiety. International Journal of Advanced Biological and Biomedical Research, 2014; 2(2): 321-327. The role of histamine in the regulation of food and water intake in mammals and birds of the review, this study evaluated the effects of intraperitoneal administration of chlorpheniramine as histamine H1-receptor antagonist, in broiler chicks on feed intake and satiety in water and was hungry. 32 male Ross broiler chicks reared in groups of four weeks, 16 samples (control and test) were then injected with 0.5 ml chlorpheniramine (40 mg per kg of body weight) intraperitoneally, feed intake and water per chick at intervals of 15, 30, 45, 60, 90 min and2, 3, 4, 5, 6, 7, 8, 9, 10, 11, 12, 21, 23 h after injection and the controls weight was recorded. The results showed that chlorpheniramine in satiety after injection caused a significant decrease (p <0.0001) in feed intake compared with the control group. Chlorpheniramine injection in starvation mode after injection induced a significant decrease (p <0.0001) in feed intake compared with the control group. Satiety in a state of chlorpheniramine in180, 240,300, 360, 420, 480, 540, 600, 660, 720 min after injection (p <0.0001) caused a significant reduction in water use. Chlorpheniramine injection, at 180, 240, 300, 360, 420, 480, 540, 600 min after injection (p <0.05) caused a significant reduction in water consumption. Attoub S, Moizo L, Sobhani I, Laigneau JP, Lewin MJM, Bado Andr(2001) . The H3 receptor is involved in cholecystokinin inhibition of food intake in rats. Life Sci; 69:469 –78. Babapour V, Tamaddonfard E (1999). The effects of ICV injections of histamine on water intake in the rabbit. In Proceeding og 26 th World Veterinary Congress, Lyon, France. Black JW, Duncan WAM, Durant GJ, Ganellin CR, Parsons ME (1972). Definition and antagonism of histamine H2-recptors. Nature; 239: 385-90. Brown RE, Stevens DR, Haas HL (2001). The physiology of brain histamine. Prog Neurobiol; 63:637–72. Costentin J (2004). Physiological and neurobiological elements of food intake. J. Ann. Pharm. Fr; 62:92–102. Cabrera MC, Saadoun A (2006). Fasting duration influences the inhibition of food intake by histamine in chickens. Phisiology & Behavior; 88: 506 -15. Doi T, Sakata T, Yoshimatsu H, Mashidori H, Kurokawa M, Jayasekara LAW, Niki N (1994). Hypothalamic neuronal histamine regulates feeding circadian rhythm in rats. Brain Res; 641: 311-18. Fujise T, Yoshimatsu H, Kurodawa M, Oohara A, Kang M, Nakata M, Sakata T (1998). Satiety and masticatory function modulated by brain histamine in rats. Proc. Soc. Exp. Biol. Med; 217(2): 228-34. Gay J, Ressayre L, Garcia-Villar R, Bueno L, Fioramonti J (2003). Alteration of CCK-induced satiety in post-Nippostrongylus brasiliensis infected rats. Brain Behav Inmun; 17:35 –42. Kawakami SI, Bungo T, Ohgushi A, Ando R, Shimojo M, Masuda Y, Denbow DM, Furuse M (2000). Brain-derived mast cells could mediate histamine-induced inhibition of food intake in neonatal chicks. J. Brain Res; 857: 313-6. Kjaer A, Knigge U, Rouleau A, Garbarg M, Warberg J (1994). Dehydrationinduced release of vasopressin involves activation of hypothalamic histaminergic neurons. Endocrinology; 135:675–81. Kuenzel, WJ (1994). Central neuro anatomical system involved in the regulation of food intake in birds and mammals. J. Nut; 124: 1355-70. Lecklin A, Tuomisto L (1998). The blockade of H1 reseptors attenuates the suppression of feeding and diuresis induced by inhibition of histamine catabolism. Phormacol. Biochem.Behave; 59(3); 753-58. Lecklin A, Etu-Seppala P, Stark H, Tuomisto L (1998). Effects of intracerebroventriculary infused histamine and selective H1 , H2 and H3 agosits on food and water intake and urine flow in wistar rats. Brain Res; 793: 279-88. Machidori H, Sakata T, Yoshimatsu H, Ookuma K, Fujimoto K, Kurokawa M (1992). Zucker obese rat: defect in brain histamine control of feeding. Brain Res; 590:180 – 6. Meade S, Denbow DM (2001). Feeding, drinking, and temperature responses of chickens to intracerebroventricular histamine. Physiol Behav; 73: 65–73. Prell GD, Green JP (1986). Histamine as a neuroregulator. Annu. Rev. Neurosci; 9: 209-54. Rao ZR, Yamano M, Wanaka A, Tatehata T, Shiosaka S, Tohyama M (1987). Distribution of cholinergic neurons and fibers in the hypothalamus of the rat using choline acetyltransferase as marker. Neuroscience; 20:923–34. Rossi R, Dei prete E, Scharrer E (1998). Effects of Histamine H1 Reseptors on the feeding and Drinking Patterns in Pygmy Goats. J. Dairy Sci; 81:2369 -75. Tamaddonfard E, Babapour V, Farshid AA (1999). Effects of IVC injections of histamine on food intake in rabbits. . In Proceeding of 26 th World Veterinary Congress, Lyon, France. Tamaddonfard E, Babapour V (2002). Feeding behavior of rabbits after intra cerebroventricular injection of histamine and its H1 and H2 antagonists. Journal of Faculty of Veterinary Medicine. University of Tehran, 57(1): 13-8. Tuomisto L, Eriksson L (1979). Antidiuresis induced by infusion of histamine into the brain ventricles of conscious goats. Eur J Pharmacol; 54:191–201.